LIMA, Peru (CNS) — A human rights organization co-founded by a Maryknoll sister has won the Letelier-Moffitt human rights award for its work with indigenous farmers high in the Andes Mountains of Peru. The organization, Human Rights and Environment, based in Puno and known by its Spanish initials as DHUMA, teaches people to defend their rights under Peruvian and international law and provides legal defense in cases of rights violations, according to Maryknoll Sister Patricia Ryan, 71, who grew up on Long Island, New York. DHUMA, founded in 2007 by Sister Ryan and others who formerly worked in the human rights office of the Catholic Prelature of Juli in Peru’s Puno region, recently won a landmark ruling that indigenous communities must be consulted before the government can grant mining concessions on their lands. 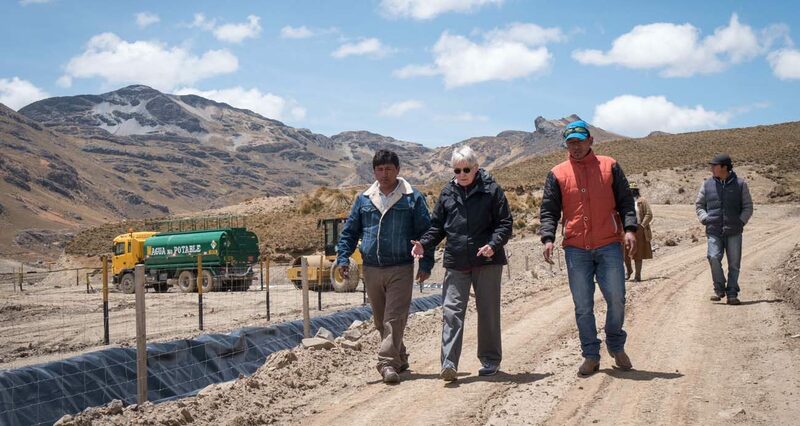 Quechua and Aymara communities on the windswept, two-mile high plain and hills around Lake Titicaca generally “are not taken into consideration on issues that affect their rights or territory,” Sister Ryan told Catholic News Service. The area has many mining concessions that overlap lands where indigenous families have lived for generations, raising sheep, llamas and alpacas, as well as crops such as potatoes and quinoa. Some mining concessions cover several hundred square miles. Peruvian law and international treaties require that indigenous people be consulted about projects that would affect their communal rights, such as the right to territory. But the concessions were granted without consultation, Sister Ryan said. People often did not know about the mining concessions until surveyors arrived, she said, and they did not know about the laws they could use in their own defense. Two of the group’s early cases are awaiting decisions from Peru’s Constitutional Tribunal in Lima. A third, involving about a dozen communities, became a landmark in late 2016 when an appeals court ruled that the government must consult indigenous communities before granting mining concessions that affect their lands. In the past, consultation was required only when the company was ready to begin production. Last year, a court ordered the government to cancel 13 mining concessions because the affected communities had not been consulted about them. The judge in that case had ruled against communities earlier in similar cases. Sister Ryan attributes the change in attitude to training DHUMA has provided to judges and prosecutors on laws and international treaties that protect communities’ rights. The organization is also providing legal aid to five people who face charges for leading a massive protest against a controversial mining project in 2011. “The criminalization of protest has become a massive weapon of the state against people who are just trying to be heard,” Sister Ryan said. Puno is one of the regions of Peru with the most conflicts over environmental issues related to mining concessions and industrial pollution that has contaminated pastures, rivers and streams. The government “could get rid of all the conflicts in the country if they only respected the rights of the people,” she added. The Letelier-Moffitt award is sponsored by the Washington, D.C.-based Institute for Policy Studies. It is named for former Chilean diplomat Orlando Letelier and his assistant, Ronni Karpen Moffitt, who worked at the organization and who were murdered in Washington in 1976 by a car bomb rigged by agents of the Chilean dictatorship. The award, which will be presented at a ceremony in October, has special significance for Sister Ryan because in 1981 it went to her congregation, the Maryknoll Sisters of St. Dominic. That honor came a year after two Maryknoll sisters, Ita Ford and Maura Clark, were murdered by government forces in El Salvador, along with Ursuline Sister Dorothy Kazel and lay missionary Jean Donovan.